Well, kind of. Actually, I just got a new Optiplex GX 745 workstation to move into. Since I spend 99% of my office time looking at my screens and working on my machine, an upgrade feels almost like a brand new office. Brian posted a picture of his office that made me sad inside. 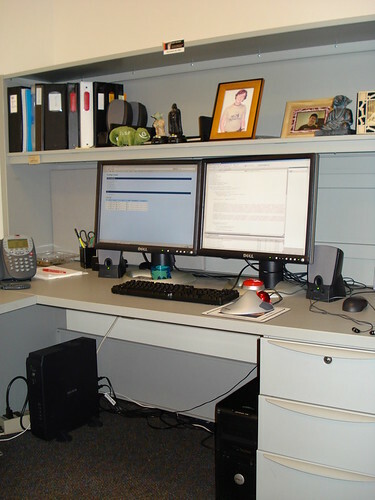 I have tagged some items in a photo of my office so that everyone can see how I spend almost all of my time. What do other people’s offices look like? Click the image for tags! I need to post a new pic of mine.. I got a docking station and a lcd now. Im mad because other departments got 2 lds. I have a crt on my desktop and an lcd for my docking station.